Published in cooperation with the Radiological and Medical Physics Society of New York (RAMPS). Intended for residents in diagnostic radiology and radiation oncology to use as a practice exam or for self study. PLEASE NOTE NEW FORMAT FOR 2009 EXAMS. 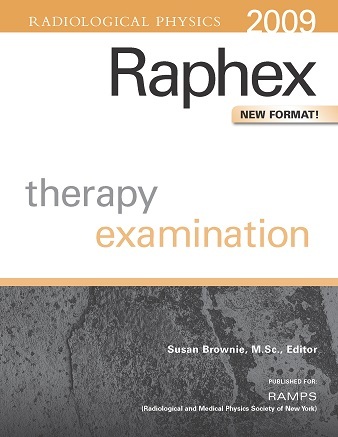 There are now two versions of the exam, Diagnostic or Therapy, with general questions incorporated into each version, and approximately 140 questions in each booklet. This format is designed to match the format of the AAPM's current curriculum for resident physics instruction. A separate answer booklet is provided for each version which gives short explanations of why an answer is correct, along with worked calculations when appropriate.